* Last Friday when Senators Grassley and Graham called for an investigation of Michael Steele, someone (I can’t remember who) documented on twitter why that was a bad idea. The main reason was that it could lead to exactly what happened today. Glenn R. Simpson, a founder of the research firm Fusion GPS, spoke to investigators with the Senate Judiciary Committee for 10 hours in August. As the partisan fight over Russian interference in the 2016 election has intensified, Simpson has urged that his testimony be released, and a copy of the transcript was made public Tuesday. It was released by the ranking Democrat on the Senate Judiciary Committee, Sen. Dianne Feinstein of California. All told, these are damning indictments against both the New York Times and the FBI. * In other news, Trump seems to have taken Kevin Drum’s advice on crisis communications. Today he hosted a bipartisan bicameral meeting to discuss immigration issues and allowed reporters to record the session. It was an obvious attempt to prove that he is neither ignorant nor mentally unfit. Take a look at how he did. Exchange between President Trump, @SenFeinstein, and @GOPLeader on #DACA. * Some people in the media are never going to learn. The President of the United States put knee-jerk racism about non-white immigration at the center of his campaign launch, and several years later still has no understanding of the issue. Folks, some real keeping? Trump was affable today. He even had charming moments. He was also ignorant on basic aspects of immigration policy and had his mind changed by each successive person he talked to. He wasn't clearly menacing. But the whole episode was ridiculous. 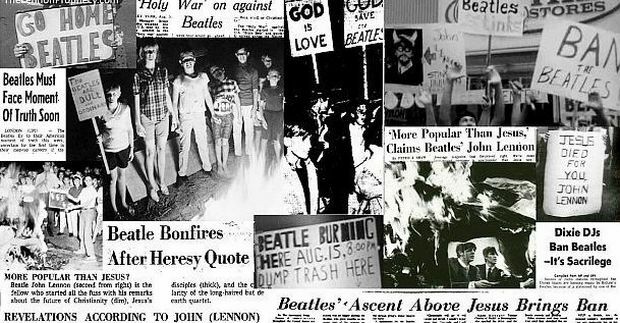 I’m old enough to remember when a similar statement by John Lennon about the Beatles in 1966 led to a massive banning and record-burning episode among evangelicals. * Finally, before we leave the Oprah-hype, we might as well get a few laughs with her from Chris Rock.